Chakradharpur is a town with a municipality in West Singhbhum district in the state of Jharkhand, India. It is located on the Chota Nagpur Plateau 62 kilometres (39 mi) west of Jamshedpur, 115 kilometres (71 mi) south of Ranchi, 101 kilometres (63 mi) east of Rourkela and 24 kilometres (15 mi) north of Chaibasa (which is the district headquarters). The town serves the mineral-rich areas of Jharkhand and Odisha, as well as the cement, steel and limestone industries in the region. The major languages spoken in this area are Santali, Ho, Odia, Bengali, Gujarati, Hindi, English, Kurmali, Urdu, Punjabi. Major inhabitants of the town are railway employees. It has a large share of area covered with railway establishments, primarily employees' quarters. It has scenic views and secluded landscapes in the periphery. In the Indian Independence perspective, Chakradharpur had been the place for freedom fighters like Raja Arjun Singh Deo, Jagabandhu Pattanayak (Jaggu Dewan), Pandit Gopabandhu Dash, Pundit Godabarish Mishra, Rahim Bux and Fakeer Chand supporting Gandhiji for his non-cooperation movement and Khilafat Movement by Maulana Mazharul Haque against British Raj in 1920. This is one of the Railway divisions generating huge profits in goods freight sector. It is also known as CKP named after its Railway Station code. It is the divisional headquarters of Chakradharpur Railway Division in South Eastern Railway Zone (India) with a huge historical touch of tribal area of Chotanagpur. 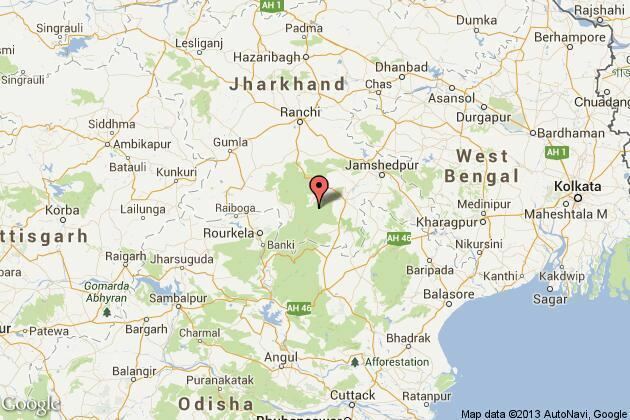 Chakradharpur is close to boundaries of two neighbouring states Odisha and West Bengal. It is enriched with huge amount of natural resources like rivers, mountain valleys, and forest reserves. 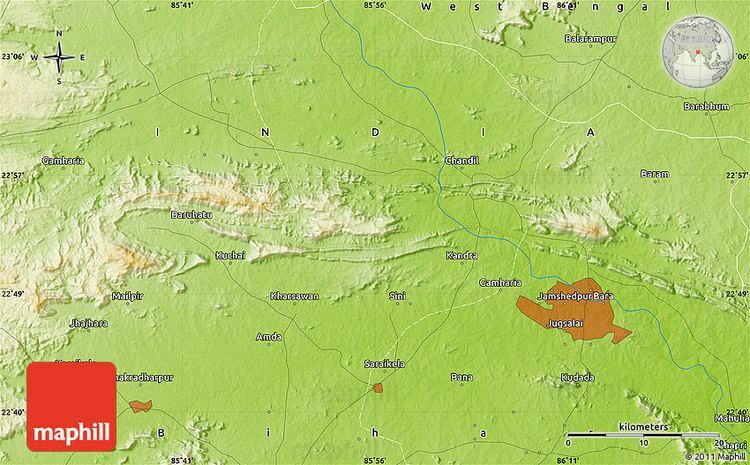 Chakradharpur is located at 22.7°N 85.63°E﻿ / 22.7; 85.63. It has an average elevation of 227 metres (744 ft). Covered by mountains on most sides, and the river Sanjay running in the South-Western periphery. Chakradharpur is believed to be a quasi hill station in the mid 1900s and still sports an equally enticing weather. In the 2011 India census, Chakradharpur had a population of 157,953. Males constitute 50.05% of the population and females 49.95%. Chakradharpur has an average literacy rate of 56.93%, lower than the national average of 59%. Odia people are the native of this place. Further many Bengalis settled here during railway establishment and as refugee from East Pakistan. There is also a good number of Telugu, Gujrati and Marwari population in the town. The Chakradharpur sub division can be divided into three residential sections. There are many villages under the Chakradharpur Village Panchayat, some of the famous villages are: Joro, Deogaon, Toklo, Dukri, Duriyam, Bharniya, Patadih, Janta, Nalita, Heselkuti, Kaida, Kudahatu, Kimirda, Gunja, Sarjamhatu, Roladih, Bagmara, Unchibita, Ramda, Tikarchampi, Jharjhara, hoyohatu, Bindasarjom, Jaipur, Banalata, Jodo, Boddar, Dalki, Ponasi, Godamdipa, Pulkani, Jamtuti, Simidiri, Hathiya, Setahaka, Etor, Kolchokra, Kera, Kansara, Dantibegna, Laudiya, Padampur, Jamid, Silphori, Chainpur, Chelabera, Chirubera, Jantalbera, Gopinathpur, Kendo, Chandri, Simidiri, Baipai, Itihasa, Asantalia, Chandri, Borda, etc. There are many more villages under the Chakradharpur subdivision. All these villages are well connected by asphalt road to the town, constructed under the Pradhan Mantri Gram Sadak Yojna. These villages are surrounded by the tributaries of the Sanjay and Binjay rivers. All the most of the villages are having a good electric facility. All the villages are having Govt. primary schools. The Kera and Kansara villages are famous for the temples of Kera and Kansara Mata respectively. The SDO Office and Court, 60 Battalion CRPF Camp, The Punjab National Bank, Madhusudhan Mahto Hindi Medium High School(JAC), Madhusudhan Public School Englich Medium(CBSE), etc. are some of the important institutions present in the Asantalia village beside NH-75E, most of the State Government institutions are coming up in this area. The Koncept Public School English Medium(CBSE) is located in the Laudia village, on the Chakradharpur-Sonua-Goilkera Road, it is run by the KPS Foundation, doing remarkable job in the fields of education in the area, the foundation also owns its own ambulance that can be used by the public 24x7. The Chakradharpur sub-divisional jail is coming up in Borda village near the Borda Bridge beside NH-75E, also the Subdivisional Court complex is under construction in Asantalia area beside NH-75E (New: NH-20). The municipality area is divided into wards, it comprises 18 wards. Starting with the Purani Basti, the oldest area of Chakradharpur, the King's Castle is present here. The Kings of Singh Dynasty used to reside here during the British Era, this area witnessed the wars with the Britishers. The city's oldest Durga Puja, said to be started by the King himself, is celebrated here, the Adi Durga Puja Samity, established in 1912. The main Howrah - Mumbai railway line runs through the middle of the city, dividing this place in two equal pats, i. e. the railway colony area and the commercial town area. Though there is two crossings, only one is used for all kind of traffic including cars. The main Ranchi - Chaibasa (and further to Odisha border) National Highway 75 also insersects main line using this railway crossing leading to heavy chaos every day. A Flyover is being constructed for the past 25 years but the work haults several times due to different reasons. Most of the business institutions are located in the Market area, including Allahabad Bank, Bank of India, Canara Bank, State Bank of India, Bank of Boroda, Bharat Capital, Narnolia Securities, Bajaj Allianz, Rose Valley, HDFC Bank, Indian Overseas Bank, ICICI Bank, Axis Bank, etc. The religious institutions includes a GEL Church near the HP Petrol Pump, The Mosques on the Rajbari Road and ward#10, The Santoshi Temple in Tambaku Patti, The Shitala Temple and The Shirdi Sai Temple near Toklo Road, The Town Kali Temple, The Rani Sati Mandir in Chandmari area, The Samshan Kali Temple near Hindu Samshan Ghat, The Jagganath Temple in Purani Basti, etc. Asia's largest preschool chain, Kidzee of ZEE Learn Limited has a branch at Chakradharpur opposite Maa Santoshi Mandir, for the Children between age groups of 1 year and 6 years. Next coming to the Southern side where many new colonies are set up. Maximum number of personal houses and apartments are located here and many constructions goes on every time, with the Gayatri Apartment of Kusum Kunj area, being the first residential apartment of Chakradharpur, located beside the NH-75E, it also holds a Commercial Complex consisting of An Electronics Mart (M/S Mitali Enterprises), a Family restaurant with AC/Non-AC floors (Big Chill), A Nursing Home (Oxford Nurshing Home)and an Exclusive Ladies and Gift Corner (Xclusive). Many other apartments constructed thereafter. The Potka, Pump road, Nagendranagar, Chiranji Block, Lokenathnagar, Bengali Tola, Retired Colony, Banglatand, etc., are some of the colonies in the South of the Howrah-Mumbai main railway track. The business institutions includes the Andhra Bank, The Life Insurance Corporation of India, Central Bank of India, Union Bank, etc. The NGO named Ekjut present in the Potka Area, doing remarkable job in the field of Health and Nutrition in adjoining Districts of Odisha and Jharkhand. The religious institutions includes The Roman Catholic and Protestants Church in Potka, The Church in Lokenathnagar, The Mosques in Potka and Banglatand. The Goddess Kali Temple in Retired Colony, Lord Shiva Temple in Balti Karkhana area, Potka, The Satsangh Kendra in Lokenathnagar, etc. The Railway Colony comprises Ward Numners 20 to 24. The Railway Colony covers the major part of Chakradharpur, located in the North-Eastern side of the NH-75E. The Railway Colony was established during the British Era, it is a well planned township with proper sanitation and electric facility. The Chakradharpur division being the highest earning division in the entire Indian Railways, the colony is well decorated and maintained. All the Railway establishments are present here. There are about eight thousand staff quarters. The entire colony is further divided into different colonies such as the East Colony, R.E. Colony, Driver's Colony, Doubling Colony, Loco Colony, Accounts Colony, Etwari Bazar, etc. The religious institution includes the mosque in Loco Colony, The Kali Temples in R.E. Colony, Etwari Bazar and Account's Colony, The Durga Mandir of Bengali Association, The Lord Balaji and Satya Sai Mandir of Andhra Association, The Gurudwara near Railway Crossing, The Hanuman Mandir of Station and Panch More, The Radha-Krishna Temple of Station and Panch More, The Chakradharpur branches of Bharat Sevashram Sangha, Shri Aurobindo Society and Shri Ramakrishna Mission, etc. The Railway Station, all the Railway Divisional Offices, Running Room, Railway Schools, Kendriya Vidalaya and all the Railway Hospitals, Main Post Office, BSNL Office, all the RPF Barracks, The Railway Power Grid and other electric substations, ATM counters, Railway Children's Parks near Divisional Railway Offices and Loco Colony, all the Railway Schools, including the S.E. Rly Mixed Higher Secondary English Medium School (ICSE), S.E. 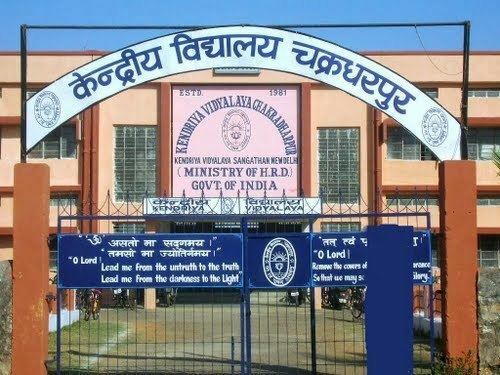 Rly Mixed Higher Secondary Hindi Medium School(JAC), Kendriya Vidyalaya (CBSE)etc., The residence of the Divisional Railway Manager and all other Railway senior Officers, the Staff Quarters of all the Railway Employees, the Residence of the SDM(Porahat-Chakradharpur) are in the Railway colony. The Balaji Temple was built with assistance from Tirumala Tirupati Devasathanam (TTD) by a group of Railway employees and social workers. It celebrated its SILVER JUBILEE in 2009. The Bengalee Association was established in 1919, till then mainly it observes the Durga, Lakshmi and Kali Pujas, it is the second oldest Durga Puja of the town, idol-makers from Kumartoli-Kolkata used to come and prepare the idols, recently in the year 2009 the permanent Idol of Goddess Durga (Mahisasur-Mardini) has been placed, with the help of the local/neighbouring residents, which is made up of one single white marble stone of 6 ft height. After that Pujas are performed throughout the year and special celebrations are organized during the Occasions like Durga Puja, Lakshmi Puja, Kali Puja, Basanti Puja, etc. Mr. Pradip Kumar Mukherjee, a veteran trade union leader and Life Insurance Corporation Of India employee, is the present General Secretary of the Bengalee Association. The Marble Idols of the remaining four Gods/Goddesses Lakshmi, Saraswati, Kartik and Ganesh were placed in the year 2013, with the help of the Citizens and local Business establishmants, which have completed the set. Apart from Religious it also serves as a Social Organisation, it observes the occasions like the Bengali New Year, Birth and Death Anniversary of famous personalities, to name a few Netaji Subhash Chandra Bose, Rabindranath Tagore, Kazi Nazrul Islam, etc. It organises special cultural programmes in these occasions. The Bengalee Association also organises Blood Donation Camps in the memories of some local personalities, who is no more with us, like Nimu Sarkar, Raju Bose, etc. The association has its own Ambulance, Oxygen Cylinder to be used in emergency. To encourage the local kids, the association organises sports meet, drawing competitions, etc. Association also has its own land leased from the S.E. Railways Near Bengali Girls High School, NH-75E Kusum Kunj area. The process is on, to lease the land surrounding the Durga Mandir from the Railways, cooperation solicited. The Bengalee Association's website is on the below "External Links", the page can also be liked on Facebook to keep track of the regular activities. There are two institutes, the South-East Institute and the South-West Institute, from the British time, which were used as theaters and recreation clubs by the Britishers. These are now used for marriage and other parties and cultural programs. There are facilities like Auditorium, Indoor Badminton Court, Tennis Court, Gym, Volleyball Court, and Basketball Court, Library etc., in the South-West Institute. Just beside the South-West Institute, located is the Chess Academy run by SERSA/CKP (South Eastern Railway Sports Association, Chakradharpur). Chakradharpur is amongst a very few places in the country to have a Chess Academy, as it was a child (Deep Sengupta) from Chakradharpur who won the Under-16 International Chess Championship, held in Spain, Chess has become a very popular game in this area, there after many kids from here participated and won in different levels. There is a stadium, named 'Iqbal Singh Sindhu Stadium' run by SERSA/CKP, the most prestigious occasion here is the Annual Steel Express Football Tournament, in which teams like Mohamadan Sporting Club Kolkata, Goa, etc. take part. Apart from these there is one newly constructed 'Kalyan Mandap', which has a very big auditorium and can easily accommodate more than thousand people for any kind of cultural meet, marriage party, etc. There is an Railway Officer's Club where the VIP parties are organized and the VVIP guests from outside are rested. It has a nice garden, party hall and luxurious rooms, along with an auditorium and swimming-pool. The Burton Lake, which used to serve as a Raw Water Reservoir, from the time of the British for the entire Railway Colony, now is a site for Boating and the town's all new hangout zone. The Railways have beautified its sides and converted it into a park, it can also be booked for birthday parties and marriages. The reservoir is directly connected with the Sanjay River at the end of the Pump Road through pipelines, where the Railway Pump House is located. From the Burton Lake reservoir the water is sent to the Railway Filter House and Sedimentation Tank near SERSA Stadium for purification and then supplied to entire Railway Colony. The Railways are looking to further beautify the Lake and surrounding areas in future. This part of the Railway Colony has a very neat and clean environment with full of greeneries, it is said that during the British Rule, Indians were not allowed in this area. The town is well known for its educational institutions. The primary education purpose is served by many of the private and government schools. Gurukul Ashram Deogaon—A unique night school for Oriya students. For bachelor's and master's degree courses, students prefer to gain admission to Jawahar Lal Nehru College which is one of the reputed colleges within the university. This institution is a constituent unit of Kolhan University and offers a variety of courses including Vocational Courses. This college was established in 1967 in the Rajbari (King's Castle) and since then it offers degrees in the three main streams - Arts, Commerce and Science. In the mid-'90s the college administration was able to get affiliation courses from University Grants Commission (UGC) of India which was certified by Kolhan University for its Vocational Studies. These include Computer Applications (CA), Information Technology (IT), Computer Maintenance (CM), Office Management & Secretarial Practices (OMSP), the Bachelor of Business Administration (BBA) and a bachelor's in Fashion Design (FD). During 2010, the college got few more respected Post Graduation courses affiliated from the university like MBA, MCA etc. The college was earlier served under the Ranchi University, before the formation of Kolhan University in 2009. Kolhan University planned to open a Mahila College around Chakradharpur. This small city is well connected with both road and rail. Ranchi, Chaibasa, Jamshedpur and Rourkela and all neighboring towns are connected with road(except Rourkela). Chakradharpur is the divisional headquarters of the South Eastern Railway. The first rail line on Chakradharpur Division was opened on 22 January 1890 with laying of 72.25 miles (116.28 km) long Purulia-Chakradharpur rail line. The rail network on the main trunk route passing through Chakradharpur division was completed on 18 February 1891 when Goilkera-Jharsuguda section was opened. With the opening of Goilkera-Jharsuguda section the main line route of Bengal Nagpur Railway (BNR) was completed and the official function for the opening ceremony of main line from Asansol to Nagpur, presided by the Viceroy of India, Lord Lansdowne was held at Chakradharpur station on 3 March 1891. Located on the Tatanagar–Bilaspur section of Howrah-Nagpur-Mumbai line Chakradharpur division plays a vital role on the South Eastern Railway. Strategically situated in the heart of Chota Nagpur plateau, Chakradharpur division serves the mineral and industrially rich areas of Jharkhand and Odisha. It is spread over East and West Singhbhum, Saraikela-Kharsawan, Simdega of Jharkhand and Jharsuguda, Keonjhar, Sundargarh and Mayurbhanj districts of Odisha. In this division lies the main corridor of freight and passenger traffic between eastern and western parts of the country. This region is aptly called the Heart of South Eastern Railway. The development of the rail network in the area presently forming Chakradharpur division dates back to the original of Bengal-Nagpur Railway, the precursor of South Eastern Railway. The first rail line in the area serving Chakradharpur division was laid way back in 1890. Presently Chakradharpur division extends over a length of 741.705 route-km of which 335.798 route-km are located over the state of Jharkhand and 405.907 km. The main line portion of the division extends over the Salgajhari-Jharsuguda portion covering a distance of 270.38 km. In addition to the main line the division has a large number of branch lines covering Tatanagar-Badampahar, Gamharia-Kandra-Chandil, Sini-Kandra, Rajkharswan-Banspani, Padapahar-Bolani-Barbil, Bondamunda-Bimlagarh, Barsuan-Kiriburu and Rourkela-Birmitrapur sections. The importance of the route covered by the division stems from the fact that it serves 6 major steel plants located in the region viz. Rourkela Steel Plant, Bhilai Steel Plant, Durgapur Steel plant, Bokaro steel plant, TATA Iron & Steel Company at Jamshedpur and Indian Iron & Steel Company at Burnpur. In addition, it also serves the cement belt of Bilaspur division and the heavy traffic in general merchandise on Howrah-Mumbai trunk route. The division covers some of the most difficult and picturesque terrains of South Eastern Railway passing through the verdant forest of Saranda including the two Saranda tunnels on the main line between Mahadevsal and Posoita stations. The division loads bulk requirement of iron and manganese ores, dolomite, limestone and other raw-materials for all major steel plants of the country. Two steel plants Rourkela steel plant and TISCO at Jamshedpur are located within the division. Besides, it serves the Sponge Iron Plant at Manikui and other ancillary industries spread around the two plants as well as the cement factories located at Jhinkpani, Rajgangpur, Tatanagar, Dhutra and mini cement plants and sponge-iron manufacturing industries around Rourkela. The main commodities loaded on the division comprise raw material for steel plants, cement and other general merchandise. The Chakradharpur division has 86 stations. Chakradharpur railway station is one of the important stations since its foundation, even Mahatma Gandhi got down here to inspect the facilities during the British Rule, which he mentioned in his book "Third class in Indian Railways". 1. The more-than-100-year-old Howrah-Chakradharpur Fast Passenger via- Kharagpur, Midnapur, Bankura, Adra, Purulia, the first passenger train to get an AC coach in the history of Indian Railways. 2. The Howrah-Mumbai Super Fast Mail via Nagpur. 3. The Howrah-Mumbai Geetanjali Super Fast Express. 4. The Howrah-Mumbai Jnaneshwari Super Deluxe Express. 5. The Howrah-Mumbai Samarsata Super Fast Express, via Adra. 6. The Howrah-Mumbai Duronto Non-Stop AC Express (No Stoppage). 7. The Howrah-Pune Azad Hind Super Fast Express. 8. The Howrah-Pune Duronto Non-Stop AC Express (No Stoppage). 9. The Howrah-Ahmedabad Super Fast Express. 10. The Howrah-Porbander/Okha Aradhana Super Fast Express. 11. The Howrah Sai Nagar Shirdi Super Fast Express. 12. The Howrah-Jagdalpur Sambaleshwari Express. 13. The Howrah-Titlagarh Ispat Super Fast Express, via Sambalpur. 14. The Howrah-Mumbai Weekly Super Fast Express. 15. The Shalimar-Mumbai KurlaT Express. 16. The Shalimar-Udaipur City Express, via Bilaspur, Kota. 17. The Shalimar-Bhuj Super Fast Express, via Bilaspur. 18. The Santragachi-Hazur Sahib Nanded Super Fast Express. 19. The Santragachi-Porbander Kavi Guru Super Fast Express, via Adra. 20. The Kamakhya(Guwahati)-Mumbai LTT Karmabhoomi Super Fast Express via Howrah, Nagpur. 21. The Tata-Alleppey Express, via Visakhapatnam, Chennai Central. 22. The Tata-Yashwantpur(Banglore) Super Fast Express, via Visakhapatnam, Tirupati. 23. The Tata-Byappanahalli(Banglore) Express, via Visakhapatnam, Secunderabad. 24. The Tata-Mumbai LTT Antyodaya Super Fast Express via Bilaspur, Nagpur. 25. The Puri-Haridwar Kalinga Utkal Express, via Bilaspur, Gwalior, Agra. 26. The Bhubaneswar-New Delhi Super Fast Express, via Sambalpur, Bokaro, Mughalsarai, Kanpur. 27. The Durg-Danapur(Patna) South Bihar Express, via Tata. 28. The Bilaspur-Patna Super Fast Express, via Tata. 29. The Asansol-Chennai Central Super Fast Express, via Visakhapatnam. 32. The Chakradharpur-Netaji Subhash Chandra Bose Gomoh MEMU Local, via Purulia, Adra. 33. The Chakradharpur-Rourkela Saranda DEMU Local. 34. The Chakradharpur-Tata-Kharagpur MEMU Local, via Tata. 35. The Chakradharpur-Barbil-Puri Intercity Express, via Chaibasa, Dangoaposi. 36. The Kamakhya-Pune Suvidha Super Fast Special Express via Asansol, Purulia, Nagpur, Panvel. Justice Harihar Mahapatra mentioned about his visit to Chakradharpur around 1916, in his book "My Life, My Work". The details of rich mineral deposits around the Sanjay-Binjay valley was mentioned in the book "Prehistoric India" by Panchanan Mitra. The book also tells us about the cave paintings and natural belongings of the adjoining region including facts from Mr. Anderson's Collections and their visit during the early 20th Century. The rich presence of the Anglo Indian Community in Chakradharpur Railway Colony was mentioned in the book "Pagan Love: Anglo Indian Story" written by Mervyn Rupert Welsh. The book also tells about the Burton Lake, which is now a hangout zone. Geological Survey of India says there is a rich deposit of a composit batholith of a banded trondhjemitic material intruded by tonalite, granodiorite, granite and alkali-feldspar granite which was metamorphosed and deformed by F3 event, which they named "Chakradharpur Granite Gneiss". Sailesh Kumar Bandyopadhyay was born at Chakradharpur, in the erstwhile Bengal, presently in the Indian state of Jharkhand. Sailesh Kumar Bandhopadyaya was a prolific writer and one of his books, Gandhi Parikrama, is prescribed by the University of Calcutta as text for the three year honors degree on Philosophy. He is awarded with Padma Bhushan in 2010. Grand Master Deep Sengupta was born here in 1988 and started chess with the Chakradharpur Chess Academy, and won the World Youth Chess Championship (boys) in 2000. Dr. Baidyanath Chakraborty, a top infertility expert attached to the Institute of Reproductive Medicine in Salt Lake, Kolkata received his early education from Railway Inter College Chakradharpur. Mahatma Gandhi mentioned his visit to Chakradharpur Railway Station in his book "Third Class in Indian Railways". The 16th Annual Utkal Union Conference was held in Chakradharpur during 1920-21.